Instagram is more than a photo and video sharing site. You could use this platform to promote your brands and services and gain lots of leads and better conversion. When it comes to Instagram marketing, one of the first things that brands look for is to build a loyal fan base, which is mostly accomplished in the form of followers and likes. Foxfans is a great source to beef up your Instagram profile with followers and likes. By building a loyal fan base, you will gain more credibility and strong online presence, which will ultimately increase your brand value and reputation on social media. The first step to a successful Instagram marketing campaign is to add a link to your profile, that is right below your bio. 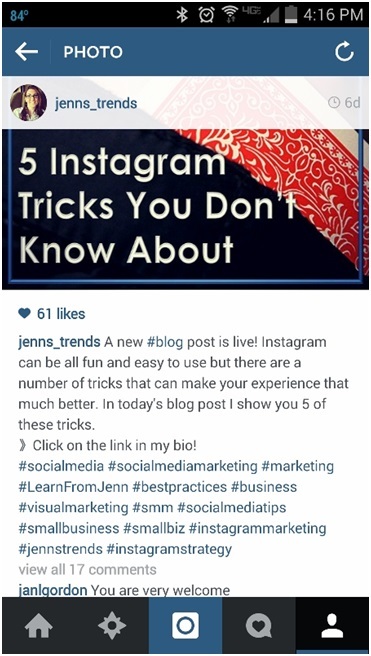 It is the only place on Instagram where you can add a clickable link. The good news is, you can change the link as often as you want to. You can add URL of your blog or website, your contest link to promote your event, lead generation link, or URLs of your landing page itself. It makes sense to learn that Google analyticsdon’t recognize the mobile traffic that comes to your blog or website from Instagram. However, traffic is traffic and it will be counted, but not thesource (Instagram). Use tools like bitly (https://bitly.com/) and goo.gl (http://goo.gl/) to keep a count of trackable links. The reach of your product or service depends on how you promote it. A diamond necklace on the counter is not as attractive as the one around a lady’s neck. Showcase your brand by starting with a business story. Short videos or even images can be more appropriate for this purpose. It’s always good to include customers trying your products or services in your videos. When it comes to showcasing their brands, whether it’s a wrist watch or sunglasses, Micheal Kors is always an inspiration. If your customers post photos or videos of your products, share them. User-generated content (UGC) are always rewarding for brands on social media. Whether you are launching a brand, offering tips, or promoting a sale, it always makes sense to put your message across via your images. The trick is to get people notice your messages. You could use tools like picmonkey or Canva to use text overlays on your images. Ways to use text overlays: to list your product price, mention benefits of your product, promote a contest, and announce a limited-offer sale. The caption is the comment, which you give when you post a photo. No matter how many comments you get from your followers, the king is always the original caption, which you have given.Make sure you add something catchy that enhances your photo, and not one that is already written on the image. Ideally, a catchy caption is one that has 200-300 characters. 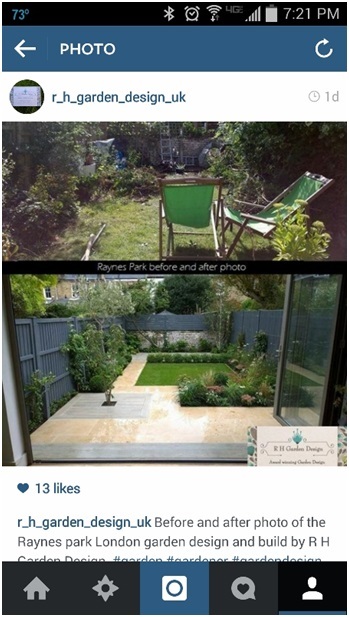 You can use call to action in your captions and entice people to click on it. This can drive more traffic to your website or blog. 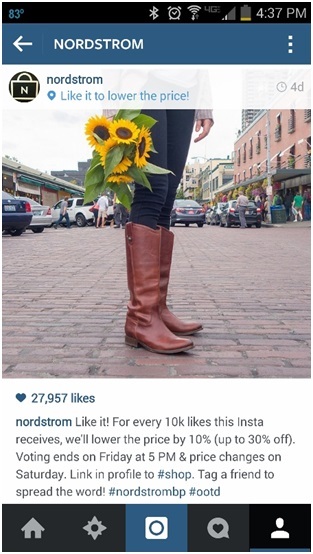 The best option to get more people to click on your captions is to give away something like an offer.See how Nordstrom has used call to action in their caption. Include relevant hashtags to your posts to improve user engagement. Choose hashtags that are relevant to your post, industry, and brand. Instagram allows 30 hashtags per post, so you could use a lot of these on your post, but the best option is to use 10-12 hashtags that are relevant to your products and services. Come up with your own hashtags to promote your brands and gain more visibility on social media. Just imagine someone finding your product by entering your hashtag, and the user sees a gallery of your product photos popping you. That’s how you gain more visibility on Instagram. Instagram is not an ad posting site. 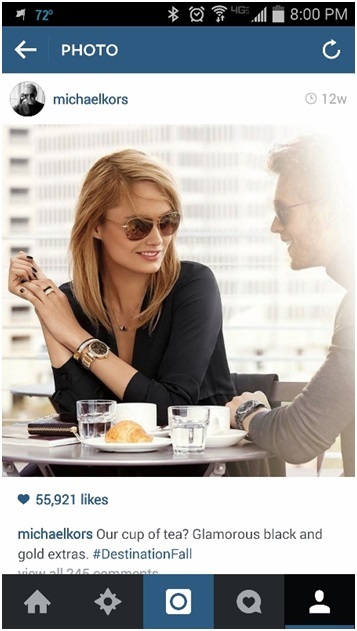 Only brands that leverage the benefits of Instagram marketing to the fullest can succeed. We hope, with these tips, you can promote your products and services successfully on Instagram and get more customers and sales. Happy Insta marketing!